Promote cigarette litter free areas while reducing the risk of fire by safely collect burning cigarette butts. The oxygen-restricting design of these classic Ultra SmokeStop cigarette disposal receptacles self-extinguishes cigarette butts. The large 4 gallon steel pail holds over 3,000 cigarette butts and is easily removed for cleaning. 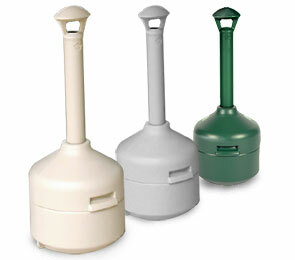 Fabricated from up to 15% recycled plastic polyethylene, receptacles will not rust and/or corrode. Rain bonnet top opening minimizes water entry. Available in the color options as shown.